Three key determinants of the airframe empty weight are the total volume, the total surface area, and the structural index. The first two are geometry-determined, and the latter is the total airframe structure (no equipment) divided by the total wetted area. Table 4.7 gives data on 10 different structural approaches developed over the past 35 years and their impact on the empty weight of a launcher with a 7-ton payload and a weight ratio of 6. They are listed in increasing weight per unit wetted area. Except for structures 8 and 10, all are cold primary structure constituted by an internally insulated cryogenic integral propellant tank, protected by internally insulated, metal thermal protection shingles that stand off from the structure/tank wall and provide an insulating air gap. The metal shingles are formed from two sheets of metal with a gap filled with a high-temperature insulation. The edges are sealed so a multilayer, vacuum insulation can be employed, if needed. Structure 8 has the same thermal protection system, but the propellant tank and primary structure are separate, that is, a non-integral tank. 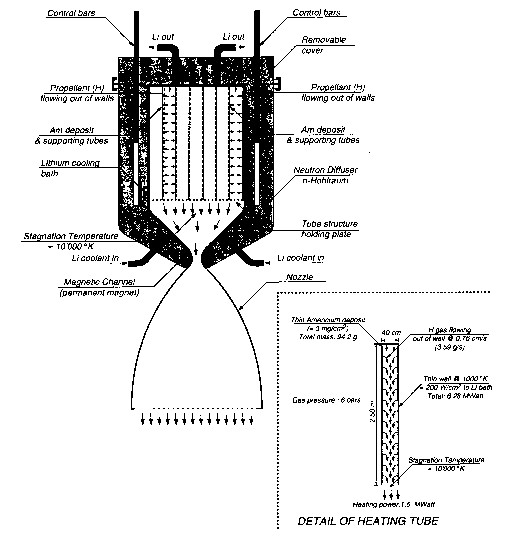 Structure 10 is a non-integral tank concept with an external hot structure, separated from the propellant tank by insulation and air gap (like the fuselage of the X-15). The SR-71 and X-15 wings were hot structures that were not protected by insulation, and the structure and fuel were heated by the absorbed aerodynamic heating. In these cases the determining structural parameter was the hot strength and stiffness of the material. In all other cases the determining structural parameter was the cold strength and stiffness of the material. All the concepts protect the structure or tank with passive insulation, except concept one that uses propellant (fuel) to pump heat away from the structure and convert it into useful work (Figures 4.17 and 4.18).